uuid : 344aa986-27ef-4ffc-82e5-1a2dc75af25e templates_id: 119624 templates_uuid: "19f850e0-6285-4e64-951e-adce0c2c26f0" title: "Distribution agreement template - Distributor contract sample " display_name: "Distribution agreement" meta_keywords: "Distribution contract agreement" description: "
Expand the market area of your products by appointing a distributor using this distribution agreement. This distributor agreement sets out the products to be sold and the distributors sales targets. You can decide whether you want the distributor to be the only seller, or one of many in a specific area. You can also specify which markets or geographical areas the distributor will operate, and when and how the agreement can be terminated. A distribution agreement is an agreement under which a supplier of goods appoints an independent distributor to market them. The distributor is required to purchase the goods and trade under his own name. The agreement sets out the products to be sold and the distributor\'s sales targets as well as the conditions under which such distribution can be executed. Do I need a distribution agreement? You need a distribution agreement if you want to expand your business into new markets or territories and you want to ensure that you have in place a well-run distribution network. What is the difference between exclusive, sole and a non-exclusive distributor? An exclusive distributor is appointed to be the only distributor in the chosen territory and the supplier cannot make sales in that territory. A sole distributor is the only distributor in a chosen territory and the supplier can make sales in that territory. A non-exclusive distributor is not exclusive or the sole distributor. This means that the supplier can makes sales and appoint other distributors in the designated territory. What restrictions can a supplier place on distributor? You can restrict the distributor from selling in areas that a supplier has reserved for itself or an exclusive distributor. In this document you can choose to restrict the distributor engaging in competing business during the life of this agreement and for a period after the end of it. 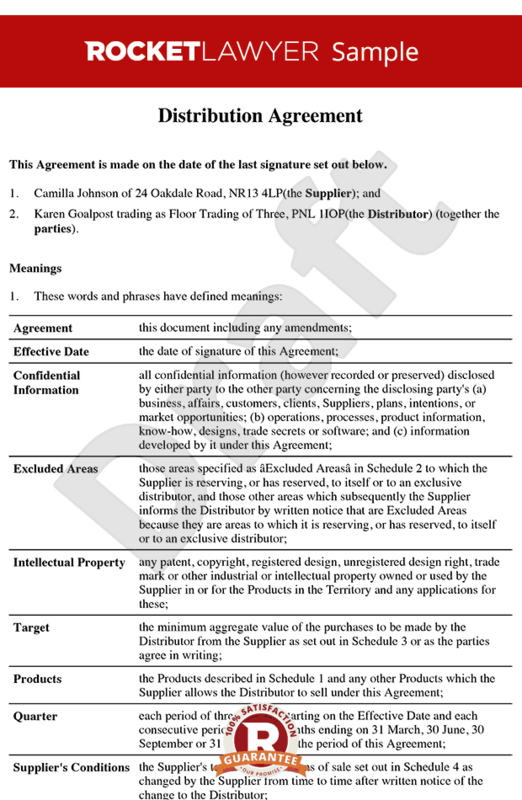 What are the distributor\302\222s obligations under this agreement? Who is responsible for any loss or damage to the products? A distributor will only be responsible for any loss or damage to the products after the products are delivered to them. How are the prices and payments set in this agreement? Prices for products can be attached in a schedule specified in an attached document to the printed agreement. How can you terminate this agreement? by giving notice. You can choose the termination notice period. You can also choose to set a \302\223lock-in period\302\224 during which no termination notice can be given. immediately, if supplier or the distributor fail to remedy a material breach within specified amount of time. A material breach occurs if there is a breach of the agreement that is not trivial and has a serious effect on the benefit that the innocent party would have otherwise derived from the contract. What is material will vary depending on the circumstances. If the distributor fails to achieve the minimum sales targets. You can specify in this document the notice period for termination in such circumstances. This distribution agreement is governed by the law of England and Wales. This document contains complex competition law elements. If you are in doubt whether you are complying with competition law, Ask a lawyer.
" created_timestamp: "2018-10-24 05:36:57.0" modified_timestamp: "2018-10-24 05:36:57.0" active: true created_by: 236 modified_by: 236 dcm_id: 311 url_slug: "Distribution-agreement" meta_description: "Expand the market area for your products by appointing a distributor using this distribution agreement. Define the areas the distributor operates in and who else can sell your product in the same area using this sample distributor agreement. Try this free distribution contract" time_to_complete: "20 minutes"
A distribution agreement is an agreement under which a supplier of goods appoints an independent distributor to market them. The distributor is required to purchase the goods and trade under his own name. The agreement sets out the products to be sold and the distributor's sales targets as well as the conditions under which such distribution can be executed. What are the distributors obligations under this agreement? by giving notice. You can choose the termination notice period. You can also choose to set a lock-in period during which no termination notice can be given. More than just a Distribution agreement template, our step-by-step interview and guidance makes it easy to create your document. Easily create online, download, print and sign your free Distribution agreement in minutes. This document is also sometimes called: Distribution contract agreement.